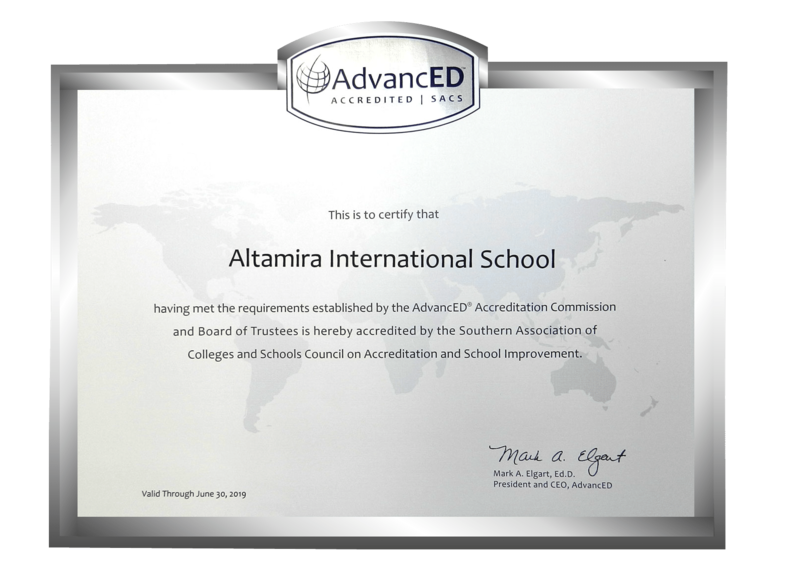 Since the 2005-2006 school year, the Altamira School began its formal process of seeking accreditation with the organization AdvancED – SACS ALMOST until in 2009, with the visit of the reviewers, we were able to be accredited by that organization. • Transfer of credits between accredited schools and regions around the world. • Standards and continuous improvement processes globally unified. The most important benefit for students is that the School is committed to increasing student achievement and is responsible for improving learning in a continuous process based on global standards. In Colombia very few institutions have this distinction. The other schools with this accreditation in Colombia are: Karl C. Parrish School in Barranquilla, Albania School The Mine in Cerrejón, Bolívar School in Cali, Granadino School in Manizales, Jorge Washington School in Cartagena, New Granada School in Bogotá, Pan-American College in Bucaramanga, English Gym in Armenia, Liceo Inglés Foundation in Pereira and The Columbus School in Medellín. During the years after the evaluation, our school will struggle with efforts to continually IMPROVE, in accordance with AdvancED’s global standards, ensuring that our students benefit from the level of education they deserve. As a school we aim to provide a rigorous training program for our students, by offering differentiated tools and techniques that guarantee cognitive acquisition of concepts and mastery of skills, ensuring the best results in national standardized evaluations. his approach is supported on qualified team of passionate educators, with ample experience in developing student competencies in different subject areas, who act as guides or “sherpas” in their learning journey. Our educational approach is centered on the Reggio Emilia philosophy, which inspires us to give major importance to early childhood as a determinant stage of development in which children define themselves as individuals. The principles of respect, responsibility and community are practiced in a well thought and enriched environment where kids interests are the priority, in a environment in which curiosity, the opportunity of exploring, experimentation, discovery are encouraged. Reggio inspired schools are based on some important principles which enhance the way in which children, parents and community integrate. The image of the child as unique in their thinking and features, with rights, potential, curiosity, desire for growth and to interact and communicate with others. The environment as a third teacher, whose physical organization is crucial in building a relational concept in which the master designs and features spaces taking into account the interests and learning needs of children, inviting them to explore and develop meaningful experiences from the use of materials and everything else offered by the environment. The teacher as a partner and researcher who proposes possibilities for the environment and the interests of children, asking questions and generating for children opportunities to develop exploration and research processes which allow the valuation of their interests and develop their processes learning, rather than sit and evaluate products and results. As a partner, the teacher lives in the company of boy and girl learning experiences. The role of atelierista, who by his knowledge of potential and management of media and alternative materials for visual expression and communication, offers children the opportunity to make visible in various ways their thoughts and ideas on topics of interest, giving them the opportunity to use additional languages ​​to verbal and written. In the studio, an art studio and lab, children explore different ways to communicate their ideas through art techniques and languages. 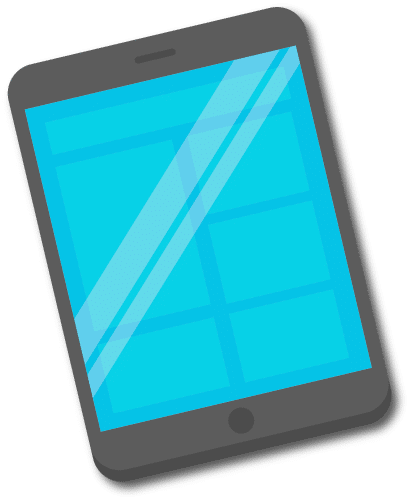 The documentation as a communication tool, in which the observation of moments and experiences of exploration is crucial to making clear how learning of children and teachers develops through experiences. The documentation also allows the community, from his knowledge of these processes take part in understanding the world of children, their needs and their views on reality. Through these principles , we value the expression, speech and thought of the boy and girl , with the primary intention to show them the way of curiosity and investigative spirit to the construction of knowledge. At Altamira International School we have constructed a program called “We Are Leaders” where students develop the skills and attitudes they need to be productive. This program is integrated with our Values, our General Learner Outcomes, our MegaSkills and finally the Seven Habits of Happy Kids. 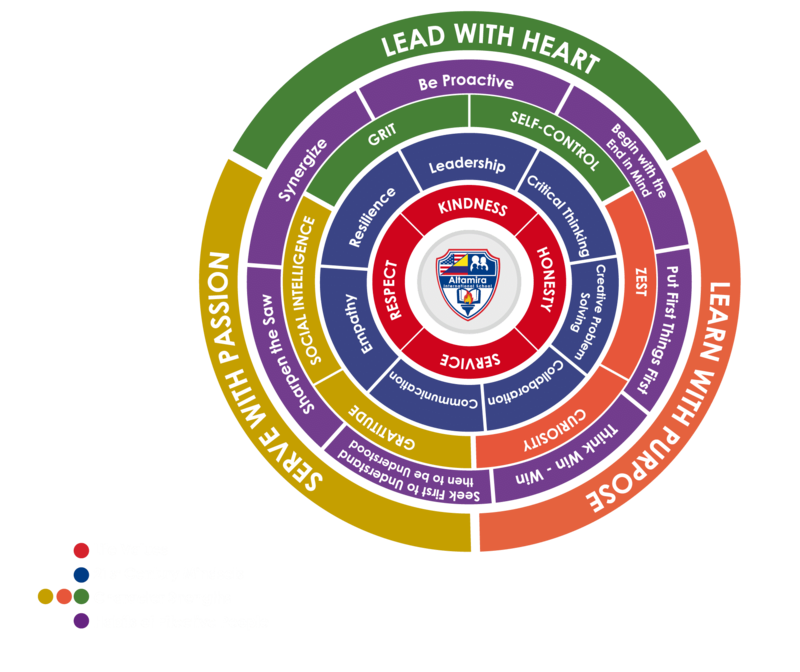 We believe that through this program, our students develop the core competencies needed to be effective in the XXI Century.